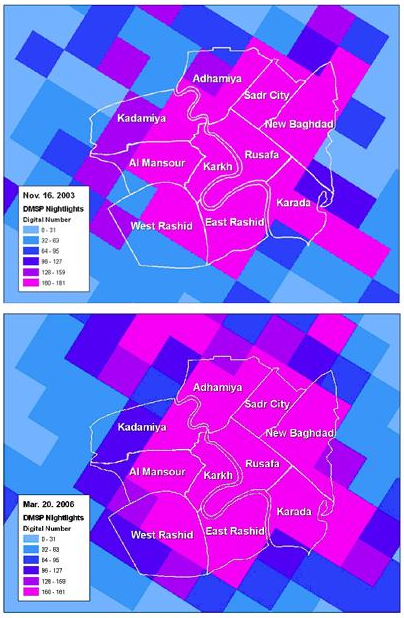 US military officials may have taken credit where none is due for decreasing violence in Baghdad with their troop surge of February 2007, data from satellite imaging suggests. By comparing the amount of light produced at night in different areas of the capital before, during and after the 30,000 extra troops had been deployed, researchers from UCLA were able to track the movements of the warring Sunni and Shiite factions. The amount of light was assumed to reflect the number of lights switched on in an area. 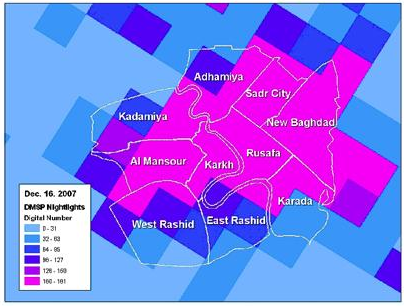 Combining that with a map of neighborhood boundaries showed that the lights had dimmed much more in the Sunni dominated west and south-western regions of Baghdad. But this change began before the influx of extra troops. The light levels in four other major cities untouched by the surge remained constant or increased during the period. The team at UCLA used four images taken on clear nights between 16 November 2003, well before the surge began, and 16 Dec 2007, after it had started, to draw their conclusions. According to the project’s team leader, “it seems that it was sectarian cleansing that has led to the decrease in violence as the Sunnis were ‘cleared out.” It is particularly ironic that the satellite images used in the analysis came from a US Department of Defence weather satellite. This entry was posted in Crisis Mapping and tagged Iraq, Satellite Imagery. Bookmark the permalink.